It's been four days since I had that accident with our rusty gate and everytime I see the stitch on my leg I really feel bad about it. I can imagine how big the scar would be when it's healed. 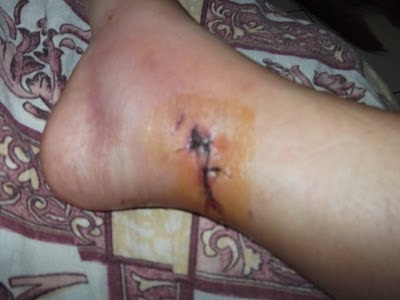 This is how my wound looks a day after that incident. It's really ewww!!! The wound was still fresh on this picture.I had 3 stitches. This was taken just yesterday while I was cleaning my wound. Seems like the wound is improving. Right now, I still hope and pray that everything would be okay with my wound. That there would be no unwanted effect. Another thing that bothers me is that I can't walk straight until now. I feel like my stitch is pulling my skin against each other everytime I try to walk straight. So I have no choice but to stay home even if I have to go out to do some errands. I hope this won't take too long. I am now thinking of remedies on how to lighten my scar. I am trying to Google which ointment, cream or gel works best. I would like to try Contractubex since I've read a lot of good reviews on this product. I hope it really works. Anyways, my friend and I were joking about my wound. She told me that I have a new nickname and it's "Stitch" and she's "Lilo". We're "Lilo and Stitch." LOL... She's the one who accompanied me in the hospital. Awww, hope your scar heals well sis. Try ko rin yang Contractubex, got a nasty scar on my knee due to my clumsiness. It's really painful thanks to pain meds. 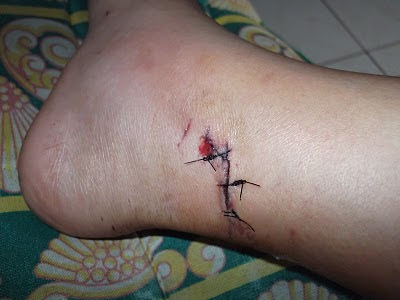 I have also taken antibiotics pero tapos na.The stitch will be removed by Tuesday. Hopefully makalakad na ko ng maayos. Yup! Yun nga, will try kung effective nga siya.